Perfect for Hydrant Flow Testing or Water Main Flushing. Uses the patented FM Approved Pitotless Nozzle™ so you’ll never have to change out a pitot because it got hit by a rock. Read your GPM flow-rate directly on the included gauge face while flowing. Weighs only 13 pounds yet handles high flow hydrants up to 2,759 GPM. 4″ NH standard connection size, other thread specs are available. Flow from 4.5”, or 5” STORZ connections with additional accessories. Please be advised that Gauge Calibrations require up to 48 hours. 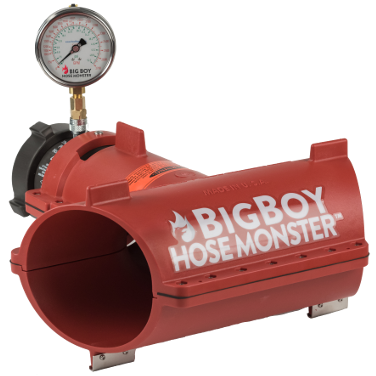 The BigBoy Hose Monster™ is used for fire flow testing of hydrants, water main flushing, and fire pump testing from connections 4″ or larger. The BigBoy Hose Monster incorporates the patented FM Approved Pitotless Nozzle™ so rocks and flushing debris pass through without causing pitot damage and accurately measures water flow-rates from 750 to 2,700 GPM. The BigBoy Hose Monster body is made from Polypropylene and the Pitotless Nozzle is made from precision machined Aluminum. The BigBoy GPM Gauge is calibrated to read flow-rate directly from the gauge face. No conversion chart is necessary. 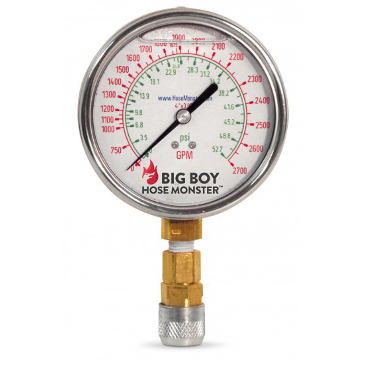 If you use another pressure gauge instead of the BigBoy GPM Gauge the BigBoy Hose Monster flow chart must be used to convert from psi to GPM. A 0-60 psi gauge is the most suitable range. The BigBoy Hose Monster is intended to be used with a hose and should not be attached directly to a hydrant. The unit comes standard with a 4” NH (National Hose Thread) connection and can be flowed from a larger sized connection by use of our reducing hose or adapters. We offer several hose options. Your hose choice will depend on: 1) the diameter of the water source connection, 2) the thread or connection type, and 3) the hose length. 4. Special Threads such as NYFD, BCT, BSP, WCT, and NPSH. Adapters or Hose of various lengths and sizes are available through us. Please contact us at 888.202.9987 with your specific requirements.